Very few people outside of South Africa had ever heard of Ladysmith Black Mambazo before Paul Simon sought them out to sing on his Graceland album in 1986. The vocal ensemble formed by Joseph Shabalala in 1960 had long been legendary in their home country, but the combined effects of the racist apartheid government of the day— which made travel outside of South Africa difficult for black citizens—and the general lack of exposure to African music in the West up until then prevented Ladysmith Black Mambazo’s music from reaching international audiences. Graceland, of course, went on to sell millions of copies and Ladysmith Black Mambazo’s international career took off in the wake of its success. Since the late ‘80s, Shabalala and his band have recorded dozens of albums, won three Grammy awards (and been nominated for 13 more) and continue to spend an average of eight months a year on the road playing to audiences worldwide. 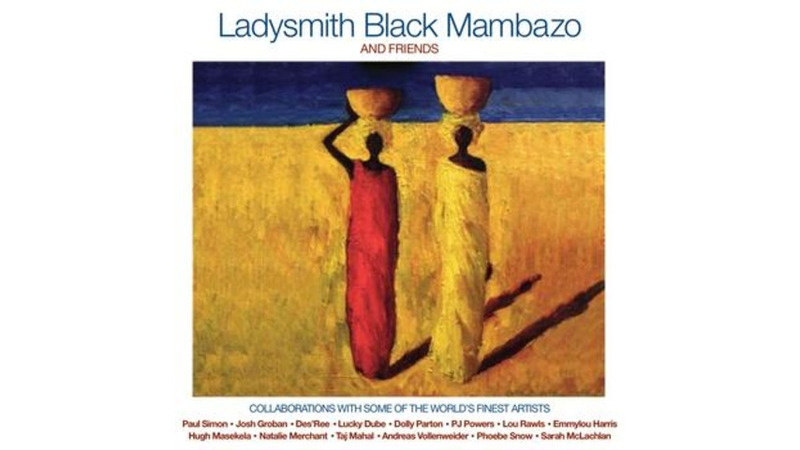 This new compilation, Ladysmith Black Mambazo and Friends features duets and collaborations with African, American and European artists selected from the band’s most popular international recordings. For the uninitiated, this bargain priced, two-CD set may be the perfect introduction to the band’s soaring vocal style. While the music of many other African performers such as King Sunny Adé, Salif Keita and Fela Kuti has never traveled beyond the ears of aficionados in the world music community, the familiar and immediately likeable rhythms and melodies of Ladysmith Black Mambazo’s songs have made the band a global success. The music on Ladysmith Black Mambazo and Friends covers a wide range of styles from note perfect renditions of R&B classics such as “Chain Gang” (with Lou Rawls) and “Ain’t No Sunshine” (with Dés’Ree) to American gospel standards like “People Get Ready” (with Phoebe Snow) and “Amazing Grace” (with Emmylou Harris). On track after track, the purity of LBM’s vocals and the clarity of their arrangements make this an album that is impossible to dislike. It’s easy to be cynical about the need for yet another version of a song like “Knockin’ on Heaven’s Door” (sung here with Dolly Parton), but it never takes more than a single verse of any of Shabalala’s new arrangements of these overheard standards to melt away all of the reservations or resistance one may have begun listening with. Perhaps that is the secret of Ladysmith Black Mambazo’s enduring appeal: they sing music that falls completely outside of contemporary style and fashion, that unlike the songs of many other African acts is almost completely devoid of overt political content, yet is so pure and uplifting that it speaks for itself and points the way to a better, safer, healthier and more integrated world where all forms of expression are possible. What more could you want from an album than that?